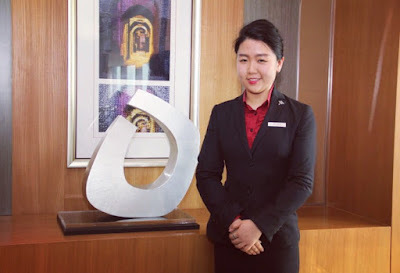 Melinda Kwok, a recent International Hospitality Management graduate from the University of Central Lancashire is now the Executive floor receptionist at the Shanghai Marriott City Centre Hotel. In March 2016, she was nominated by the General Manager, Mr. Frank Sanders, to join the Marriott Junior Business Council. The council doesn’t just improve personal leadership skills for its members, but also helps to emphasize Marriott’s team spirit. Melinda was nominated to join as her out-going personality, combined with her inner creativity was felt to be the perfect combination for a Council member. Mr. Silvio Rosenberg, the President of the Business Council appointed Melinda to be the Designated Event Planner for May. Her task was to plan and deliver a Team Building Day for Council Members. During the event planning process, she carefully planned activities and exercises for participants, drawing on skills she’d developed during her UCLan degree such as time management, communication and strategic planning. She had to pay careful attention to the small details to ensure that the event would achieve its objectives. Melinda’s next project will be the ‘Mid-Autumn Festival’. The event will celebrate the fire men for being heroes, she’ll be organising the best cake making competition again as well as various group games and activities to make it a fun filled day for all.